I'm very happy to announce the availability of OpenSesame 3.1.0 Jazzy James. This is a major new release that brings many features and improvements. OpenSesame 3.1 is fully backwards compatible with 3.0. OpenSesame has a new icon theme, based on Moka by Sam Hewitt. In addition, the user interface has been redesigned based on consistent human-interface guidelines. We hope you like the new look as much as we do! 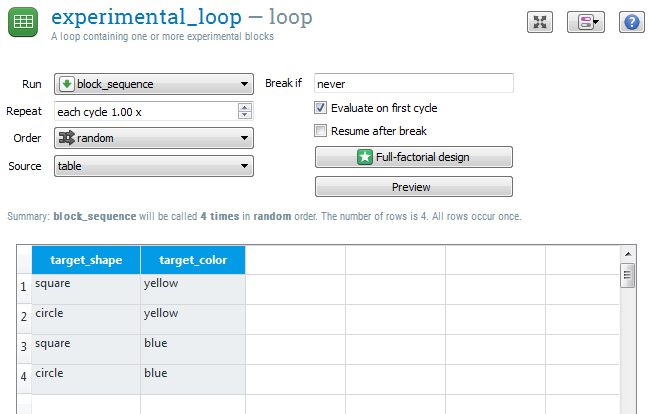 The loop is now easier to use, and allows you to constrain randomization; this makes it possible, for example, to prevent the same stimulus from occurring twice in a row. The coroutines plugin is now included by default. coroutines allows you to run multiple other items in parallel; this makes it possible, for example, to continuously collect key presses while presenting a series of sketchpads. You can now log into the Open Science Framework (OSF) from within OpenSesame, and effortlessly synchronize experiments and data between your computer and the OSF. Thanks to the Center for Open Science for supporting this functionality! There is a new standard Python object: responses. This keeps track of all responses that have been collected during the experiment. Congrats Sebastiaan on this release that has some great new stuff! This version should work more reliably on all major operating systems (yes, also on Mac OS this time) than the other solutions that were available before (vlc, gst). We have tested the player thoroughly, but you may still experience some errors or unintended behavior (it is the player's first ever release after all). Please report these at the issue tracker on Github. In any case, I'd love to hear your experiences and suggestions on this new player after you have given it a spin. The first time you use media_player_mpy, it will automatically download a program called ffmpeg. This program performs the actual decoding of the video files that you play. While ffmpeg is downloading (which may take a while), your experiment may give the impression to be stuck, but rest assured, it will continue after the download is finished. We hope to integrate ffmpeg into the next releases so this initial separate download will no longer be necessary. media_player_mpy offers can use three different modules for playing the audio stream of a video. They can be selected from the sound renderer dropdown box on the player's configuration page. We have had varying experiences on different computers and operating systems with the same sound renderer, so you will have to test which one works best for you. At the moment, we think sounddevice (which is selected by default) is the most reliable, but do try the other options if this one causes problems or choppy sound playback. Due to a new way of creating the Mac OS X app, it now also supports multiprocessing. This option can be selected on the preferences panel in the runner section. Multiprocessing increases the stability of OpenSesame by running the experiments in a separate process. Everytime an experiment is run, it starts with a clean slate of memory. If an experiment does crash, it no longer drags down OpenSesame with it entirely. Hopefully you like all these new goodies! Fantastic - thank you Sebastiaan et al.! It looks really awesome. I'm particularly delighted with coroutines and integration with OSF. Well done, and thanks for all of your hard work. Unfortunately, I could not run it on my PC (Windows 8.1). It just did not start. Yes! Please provide more details! What exactly happens when you start OpenSesame? Which package of OpenSesame are you using? And which version of Windows 8.1 are you using? Hello, I started working with Open Sesame a about a month ago and I find it extremely useful! I just upgraded to OS 3.1.0 and tried to run an experiment that was built on version 3.0. All is well, except for when I try to change the font to Arial (it has the characters I need, which are: ț, ș, â, ă, î; this worked perfectly in OS 3.0) by going to 'other' fonts. I receive an error (see image). Do I need to upload a .ttf to the file pool or is this a bug? Thanks so much! Cheers! When I double click on the shortcut nothing happens. The process cannot be found in the task manager. I tried starting it as administrator, tried different 'compatibility' options, but nothing helped. 3.07 is still working fine. When I double click on the shortcut nothing happens. The process cannot be found in the task manager. I tried starting it as administrator, tried different 'compatibility' options, but nothing helped. 3.07 is still working fine. If you try to launch these directly, does either of them work? And, if so, which one? Go to the OpenSesame folder by typing cd "\Program Files (x86)\OpenSesame", where you may have to change the folder so that it matches the folder where you have installed OpenSesame. This will probably crash, but at least you should see some informative output. Please post that here! This will help us to resolve the issue. 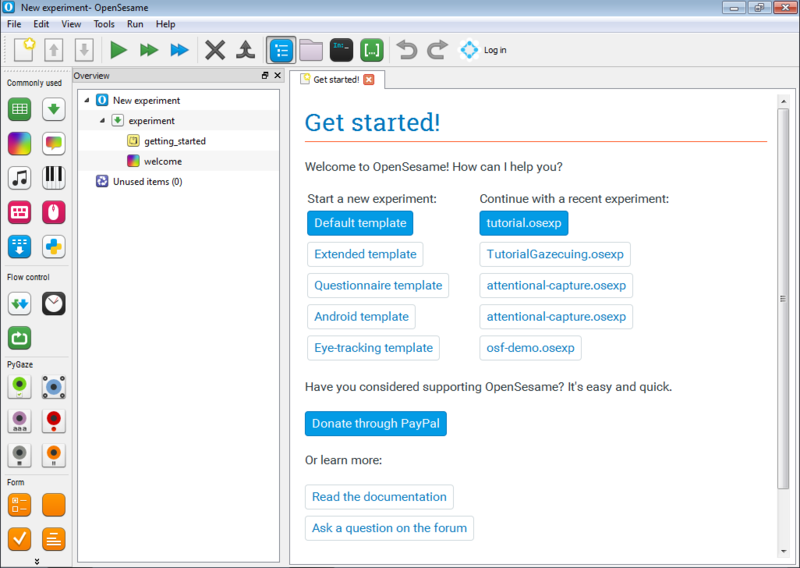 I am running an experiment that was built with OpenSesame 3.0 on the new OpenSesame 3.1 release. Previously, I had used run if [response] = None to display items if the participant did not provide a response. This worked fine on 3.0, but seems not to display for 3.1. I noticed there were some changes to the response function, but it appeared that if a participant did not provide a response, then var.response and var.response_time would both be None. Is there a different way this should be coded in 3.1 that I'm missing? @ghosty Thanks for digging into this. Apparently there is a problem with PyQt4, which is the graphical toolkit used by OpenSesame. The exact error is (again) hidden. Would you mind trying the following? This should hopefully show the exact problem that prevents PyQt4 from loading. @ghosty Thanks! This information is really helpful. I'm not sure we'll be able to resolve it, but at least we have an idea where the problem comes from! Technically, this is a Python-style statement that checks whether the response is the string 'None', as it should be, or the special None value, which is shouldn't be (but currently is). sebastiaan, Thank you so much for your attention to my problem. I really hope it will help.